A new generation of mobile users are becoming so emotionally attached to their phones that they cannot live without them. This is one of the key findings of a study into how people use their mobile phones entitled Me, My Mobile and I. The annual study from research firm Teleconomy reveals that 10 to 14-year-olds - dubbed M-Agers - are rapidly becoming the most sophisticated users of phones. Even toddlers are able to tell the difference between incoming phone calls and text messages said Professor Michael Hulme, chairman of Teleconomy. For children, phones are not so much about communication as a device for downloading things such as pop news, games and ringtones. "These M-Agers are very clued up on phone functions. They want highly functional phones and they give them a high degree of personalisation," said Prof Hulme. Phones are rapidly replacing trainers as a social marker. "The phone plays a role in the playground and can be a ticket to entry into certain groups," he said. In some cases the phones themselves are becoming 'virtual playgrounds', as children fill their free time with texting their friends and playing games. 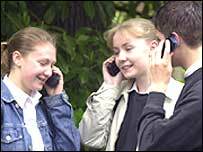 Youngsters are also far more aware of the more sophisticated uses of phones, with 71% aware of video-calling compared to 54% of adults. About two-thirds knew about Java applications like games, while only 44% of adults were aware of this function. This will all be great news for operators keen to push more and more services on phones. "They are growing up ready to take on these services," said Prof Hulme. The study found that adults were more ambivalent about their phone use, with a growing number of people (18%) in denial about how much they need their mobile phones. "The denier believes the myth that they are in control of the device but when we spoke to them it began to dawn on them that they were not," said Prof Hulme. "This group represents a field day for the network providers as they put themselves on tariffs too small for their needs and then go drastically over their free minutes and text allowance," he added. For a quarter of the population, their relationship with their mobile was more honestly assessed - they admitted that they just could not live without it. "These people have their phone on 24 hours a day. They are frightened of missing a call because to not be available is to cut oneself off from one's social network," said Prof Hulme. Phones are rapidly replacing address books, diaries, watches and alarm clocks as people turn increasingly to their handsets to help manage their lives. They are also becoming photo albums as people personalise their handsets with things dear to them, such as pictures of friends and family. "One woman who liked a drink had a picture of a pint of beer on hers," revealed Prof Hulme. There are lessons here for manufacturers concentrating on making phones as smart and function-filled as possible. "There are actually more pragmatic ways of making money," said Prof Hulme. These include increasing the amount of space for storing texts, giving more indication of where calls are coming from and a better way of ordering all the information people are increasingly storing on phones. The Me, Myself and I study conducted 1,400 interviews between February and April including questionnaires, face-to-face interviews, focus groups and telephone surveys.